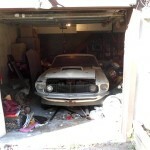 Okay, so technically it looks like a dumpy garage, and not a barn, but it most definitely appears to be a real 1969 Boss 429 Mustang WITH the 429 engine sitting next to it! 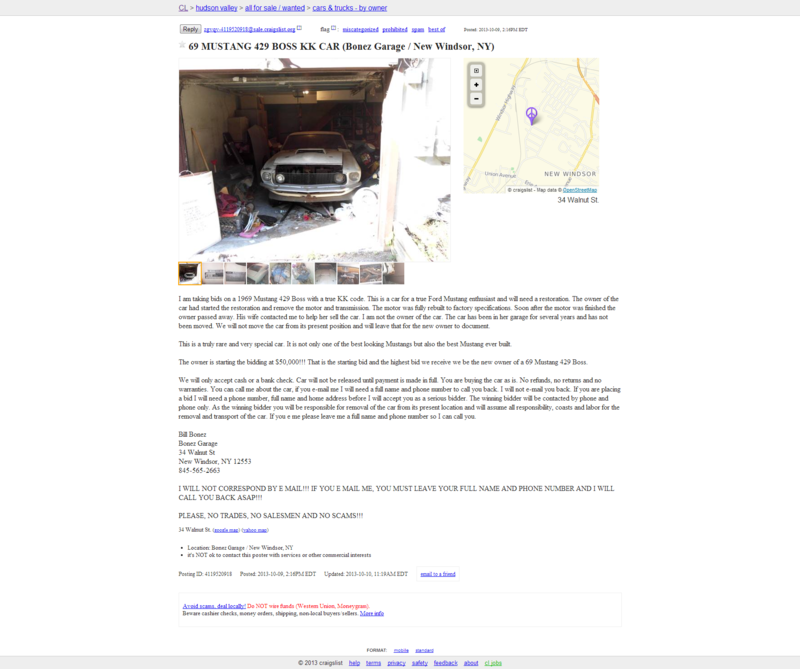 AND it has a manual transmission bellhousing strapped to the back… on craigslist… right now. Holy crap, is this real life? With only 859 of these cars ever made, this would most definitely be the holy grail of Mustangs. These massive engines were conservatively rated at 375 horsepower and 450 foot pounds of torque, though real world says that they were likely in the 500+ horsepower range, with gobs more torque. Each one of these cars had a tag on the door with a KK label that stood for Kar Kraft. 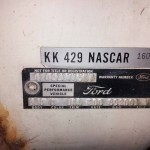 That was the company that got the cars directly from Ford during production and widened the shock towers, modified engine mounts, lengthened inner fenders, and modified the suspension to make this monster 429 Ford engine slide in. 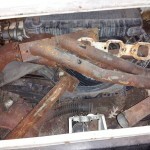 Oh, and have the car stay together. 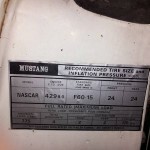 “I am taking bids on a 1969 Mustang 429 Boss with a true KK code. 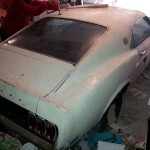 This is a car for a true Ford Mustang enthusiast and will need a restoration. 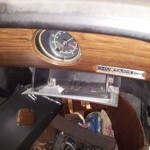 The owner of the car had started the restoration and remove the motor and transmission. 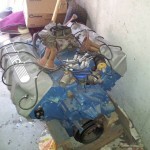 The motor was fully rebuilt to factory specifications. 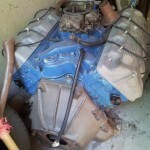 Soon after the motor was finished the owner passed away. His wife contacted me to help her sell the car. I am not the owner of the car. 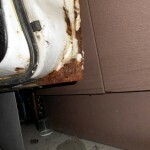 The car has been in her garage for several years and has not been moved. We will not move the car from its present position and will leave that for the new owner to document. 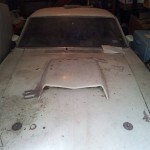 This is a truly rare and very special car. It is not only one of the best looking Mustangs but also the best Mustang ever built. The owner is starting the bidding at $50,000!!! 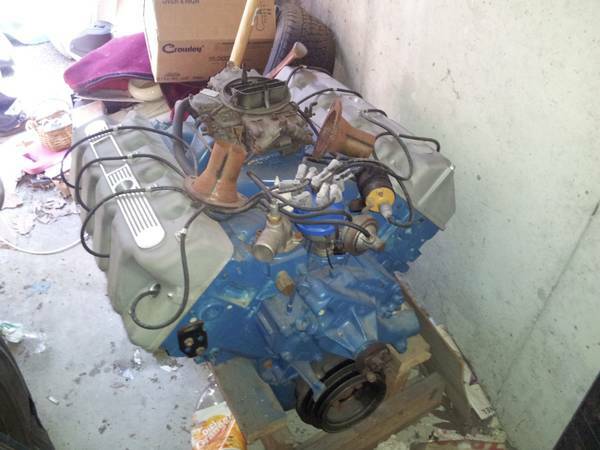 That is the starting bid and the highest bid we receive we be the new owner of a 69 Mustang 429 Boss. He also includes his address and phone number, but I will let you grab that yourselves. So if you have the cash and the need for the most badass Mustang ever built, now is the time to make your move.